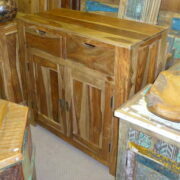 Block fronted reclaimed small sideboard. 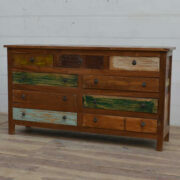 Reclaimed small sideboard with some of its original paintwork. 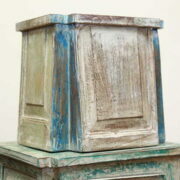 The drawer and cupboard fronts have had small mini painted blocks inserted to make this item highly original. 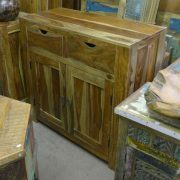 These old or unusual items are mainly from Rajasthan, India. 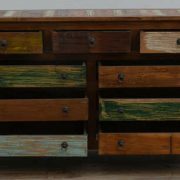 Many items are part new, designed around original old doors to create practical cupboards and sideboards with a traditional Indian feel. 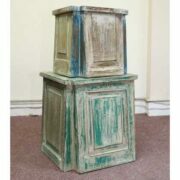 Other pieces are true original Indian pieces once used in their homes such as damchiyas (originally used to store the brides dowry) or we’ve even had an old Indian village fridge! Want something different? Then old or unusual is the place to look.